BARCELONA, Aug. 18 (Xinhua) -- Thursday's terror attack in Barcelona, Spain, which left 13 people dead with its key suspect still on the run, has shocked the country and the entire world. The Spanish police suspect that it was one of multiple planned attacks and launched an anti-terror operation on Friday as they continued a manhunt for the driver of a van that was ploughed into pedestrians in Barcelona, killing at least 13 people and wounded more than 100 others. Four and possibly five suspects were killed early Friday morning in Cambrils, a seaport town about 120 km south of Barcelona, in a sweeping operation which the police said foiled another terror plot linked to the deadly van attack in Barcelona. The shootout in the night came as security forces launched a manhunt for the driver of the van that mowed through crowds of tourists on one of Barcelona's busiest thoroughfares Thursday. "We are working on the hypothesis that events in Cambrils respond to a terrorist attack. We have killed its alleged perpetrators," Catalan police wrote on Twitter. Through social networks, Barcelona's police have asked residents in Cambrils and the adjacent region to stay home to avoid danger. "If you are in Cambrils, avoid going out. Stay home, stay safe," the police tweeted. Two suspects, one Moroccan and one from the Spanish north-African enclave of Melilla, have been detained in relation to the attack. 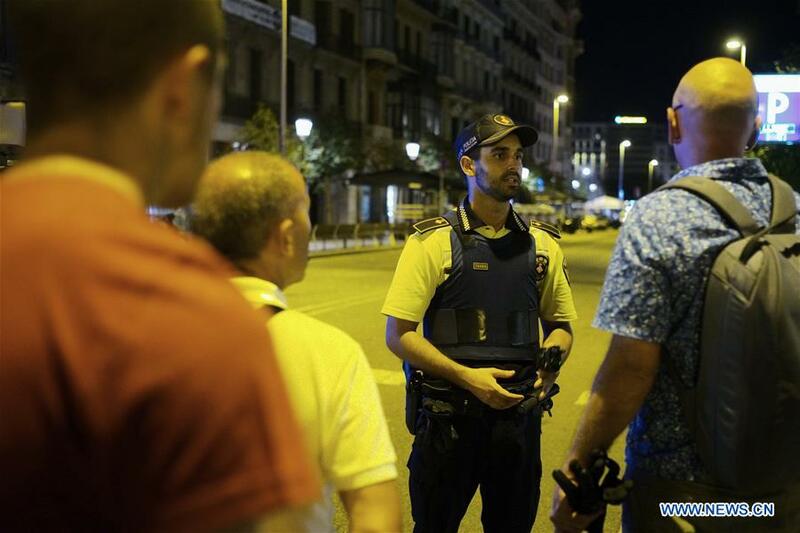 Downtown Barcelona has been sealed off by security forces as the van driver is still at large. The Islamic State (IS) has claimed responsibility for the massacre. If the claim was verified, the brutal killing would be the latest in a spate of attacks over the past year in which vehicles were employed to harm ordinary people on the streets of European cities. Images posted on the internet showed that the killed terrorists were wearing what appeared to be explosive belts. It remains unknown how many people were involved in the van attack and other related incidents on Thursday. Witnesses described how the van was going at a high speed, attempting to cause "as much damage as possible" before fleeing the scene. "I was totally shocked ... I can do nothing but waiting for permission of the police to enter my hotel," said a 16-year-old French girl. The girl, who required anonymity, said she was just 10 meters away from the van and was frightened into a fit. "When terrorists attacked Paris, I was far away from the spot, but today I saw the tragedy myself, hoping I can fall asleep tonight," said the girl's s brother whose three-member family came to Spain for vacation. It was the worst attack in Spain since March 2004, when Islamist militants placed bombs on commuter trains in Madrid, killing 191 people and wounding more than 1,800 others. "Today the fight against terrorism is the principal priority for free and open societies like ours. It is a global threat and the response has to be global," he told the media in Barcelona. Rajoy said he was in "contact with all the administrations," and the priority "is to help the injured and facilitate the work of the security forces." "This cowardly attack has deliberately targeted those enjoying life and sharing time with family and friends. We will never be cowed by such barbarism," European Commission President Jean-Claude Juncker said in a statement. "I send my deepest condolences to the families and loved ones of the victims, as well as to Prime Minister Rajoy and the people of Spain. My thoughts are with the people of Barcelona," he said, adding that the Commission is "at the full disposal of the authorities for any help or assistance necessary." Echoing Juncker, European Council President Donald Tusk tweeted: "All of Europe stands with Barcelona. Our thoughts are with the victims and all affected by this cowardly attack on innocents." French President Emmanuel Macron tweeted: "All my thoughts and France's solidarity with the victims of the tragic attack in Barcelona." The United Nations Security Council condemned "in the strongest terms" the terrorist attack and expressed deep sympathy and condolences to the families of the victims, as well as to the government of Spain. Shortly after the attack on Thursday, the Spanish Ibex-35 stock exchange saw nearly a full percentage point knocked off its value and slipping back below the 10,500-point mark on a day when the country's banks suffered important losses. A Hong Kong tourist was slightly injured in the Barcelona attack, said the Consulate General of China in Barcelona. All Chinese citizens are advised not to approach the area where the attack happened and those who were close to the area should keep calm and follow police's instructions, the consulate said.